Most marketers did not enter their profession to analyze data and build process. They want to develop strong brands, build creative campaigns and deliver compelling content. The new requirement for marketing analytics and automation is no longer a 'nice to have'. Measurement is not simply about revenue justification; it is the means by which great marketers can irrefutably demonstrate their skills. 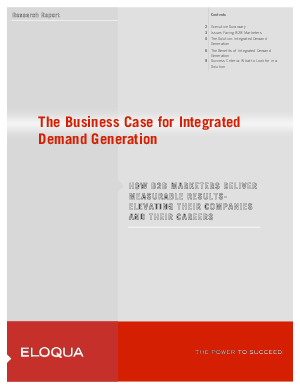 This has led to the rise of the integrated demand generation platform - a system of record for planning, executing and measuring multi-channel campaigns. With this solution, marketers are not just communicating to prospects. They are closely monitoring and reacting to the implicit buying signals in prospect's response to marketing messages to systematically drive the sales cycle. This white paper presents the business case for automating marketing in a truly integrated fashion.